I want to convert csv data to RDF N-Quad format . 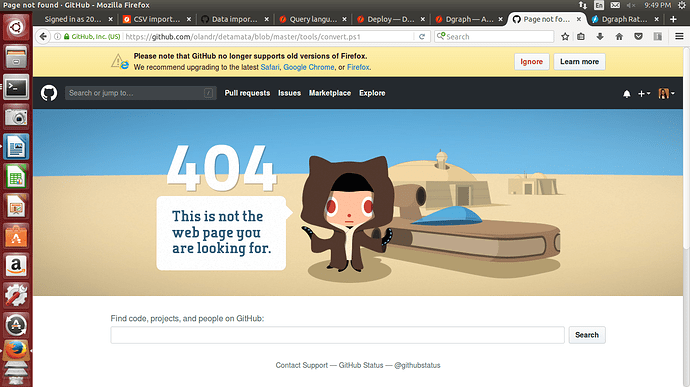 I have looked for a tool on github but it shows error 404. Is there any way for this conversion? If you’re looking to load data into Dgraph, you can convert CSV into JSON and then load it into Dgraph. Actually I have 98522 triples in csv file …so after converting it into JSON I have run it into mutation console but it shows an error that Transaction aborted rpc error. It works fine till 40000 triples. Aborts transactions are OK during a live load. The live loader will retry an aborted transaction until it succeeds. If it gets stuck retrying the transaction, then it’s possible that the data is invalid and the mutation never succeeds. Bulk Loader supports JSON data in the latest version. JSON support for the Live Loader will be available in the next release this month. Okay so I can use Bulk loader as of noe for JSON data…right? Bulk Loader supports JSON data in the latest release v1.0.13.